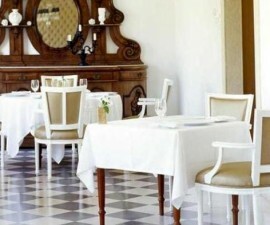 The Panorama Restaurant is located in the Best Western Hotel D. Luis, slightly outside the main city centre of Coimbra, Portugal. It occupies an enviable position on the banks of the River Mondego, next to the Santa Clara-a-Velha monastery, which has recently been restored and reopened as one of Coimbra’s primary sightseeing destinations. 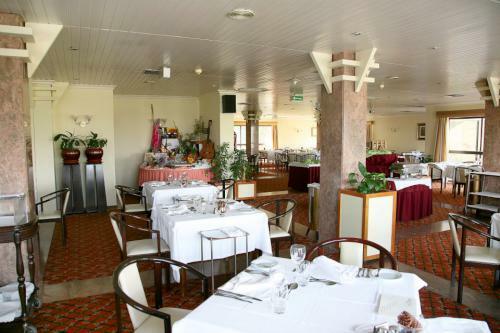 As its name may suggest, Panorama Restaurant is located on the upper floor of the hotel and offers panoramic views out over Coimbra’s city skyline. In fact, it is precisely for these magnificent views that many of the city’s locals and visitors flock to eat here, and most are happily rewarded by the added benefit of some very tasty food! 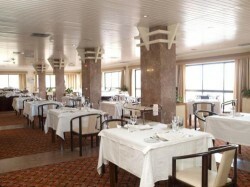 Panorama Restaurant is open daily for breakfast — mostly guests only — and for lunch and dinner. It specialises in serving international favourites along with some of the best traditional dishes from Portugal, and is notable for its generously sized dishes, as well as the convivial atmosphere that it offers. While the atmosphere in some hotel restaurants can seem a little cold, the Panorama Restaurant offers a warm welcome and friendly service by well-trained hotel-standard waiting staff. 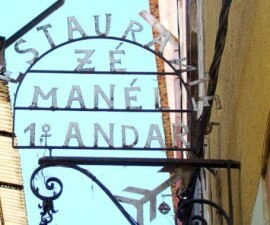 The maître d’ is helpful with wine suggestions and the waiting team are knowledgeable enough about the menu to make some excellent recommendations. Favourite dishes include chestnut soup, cod with mushrooms, pork with chestnuts and a delicious traditional “toucinho do ceu”. The wine list offers plenty of choice from Portugal and further afield. Sweet hot chocolate makes a superb alternative to an espresso to top off a tasty meal. Panorama Restaurant provides a grand setting in which to dine, with pristine white linen and grand columns, plus of course the large windows which afford such an attractive view over the city. It is a popular destination for groups and families, as well as for couples, and makes a good choice for celebratory events such as the New Year’s Eve, an event celebrated with a lively gala dinner. Live music is played on regular occasions throughout the year, providing visitors with some excellent memories of their dining experiences in Coimbra, Portugal. 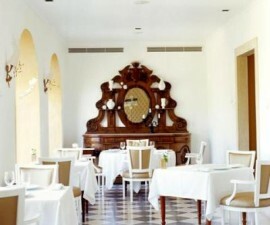 Panorama Restaurant is open for lunch from 12.30pm to 3pm, and for dinner from 7.30pm to 10pm. Guests staying within the hotel can also order via room service. Although the restaurant stands inside a hotel, it is always well advisable guests coming from outside the hotel book a reservation.